Dubai is the second largest city of the United Arab Emirates, located on the east coast of the Arabian Gulf , it stretches around 72 kilometers along the coast , with an area around 3885 km, equivalent to 5% of the UAE. The population of Dubai city is about 1.4 million, and geographically Dubai divided into two parts, the Gulf of Dubai Creek and southern section called "Bur Dubai". 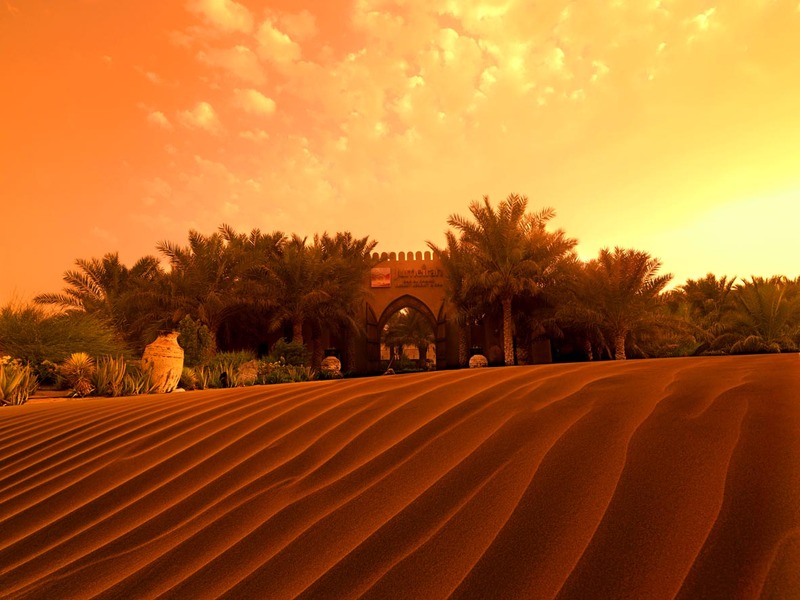 Dubai is characterized by its bright sun, magical desert, fascinating beaches, luxury markets, Impressive heritage area, and unique architecture, which receives every year millions of visitors from all over the world. The establishment of Dubai dates back to 1833 when people group belongs to the Bani Yas tribe, led by Al Maktoum settled in the creek area. Later, a bold decision from His Highness Sheikh Rashid Bin Saeed Al-Maktoum to raze the bottom of the creek and clean it, led to increasing the number of ships in the harbor and thus increased the volume of goods imported to Dubai, to become an important trading center and pioneer station for re-export. 1966 was important in the history of Dubai because of the discovery of oil, where Sheikh Rashid invested oil imports in the improvement of the infrastructure for the development of Dubai, So he constructed schools, hospitals, modern ports and airport. By 1971 Dubai joined the united Emirates Abu Dhabi, Sharjah, Ajman, Umm Al Quwain and Fujairah, in the following year Ras Al Khaimah joined to the Union of Emirates in 1972. Dubai is unique and has a lot to attract tourists and investors from all around the world, there is a wide range of hotel projects, towers and residential complexes which mix between the Islamic ancient architecture and the modern equipment and designs. Burj Khalifa: is the tallest skyscraper built by man in the world, up 828 meters, and contains the most elegant, 7-stars hotel "Armani", and the highest restaurant in the world "Atmospher"
Palm Island – Jumeirah: It’s a man-made island on the shape of palm tree, and composed of three parts, the trunk, the crown and 17 fronds, all surrounded with a semicircular artificial barrier, contains a number of hotels and resorts most notably: the Atlantis Hotel, Jumeirah Zabeel Saray Hotel, Rixos and other hotels. Burj Al Arab Hotel: is the world's most luxurious and elegant 7-stars hotel, it is located on an artificial island just a hundred meters from the seashore. 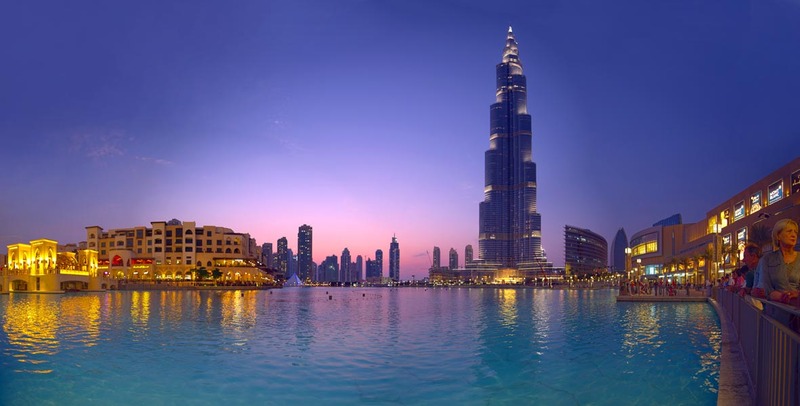 Downtown Dubai: is the most elegant kilometer square in the world, it includes the longest and the biggest and the best, in terms of Burj Khalifa, the tallest in the world, Dubai Mall, the largest in the world, The Dancing fountain, the best in the world. The Walk at Jumeirah Beach Residence: is a walkway surrounded by public squares, fountains, Jumeirah Beach, hotels, restaurants and cafes. Dubai Aquarium: which contains 65,000 marine animals, like sharks, eels, predatory fish and sea horse. It locates in two places, first in Dubai Mall under the name of "Dubai Aquarium" and the second in Atlantis Hotel under the name of the "Lost chambers". Water parks: It’s a fun and thrilling place that allow you to experience the water slides, water roller and ships, and the adventures of the rapid river and other games, all these are available in three parks: Aquaventure Waterpark, Wild Wadi Waterpark, and Ice Land Waterpark. Ski Dubai: Which is snow capped throughout the year, with five tracks vary in length and difficulty and steeper to enjoy the skiing, snowboarding or just playing in the snow , also you can enjoy watching penguins play and have fun under the water together or even play with them. 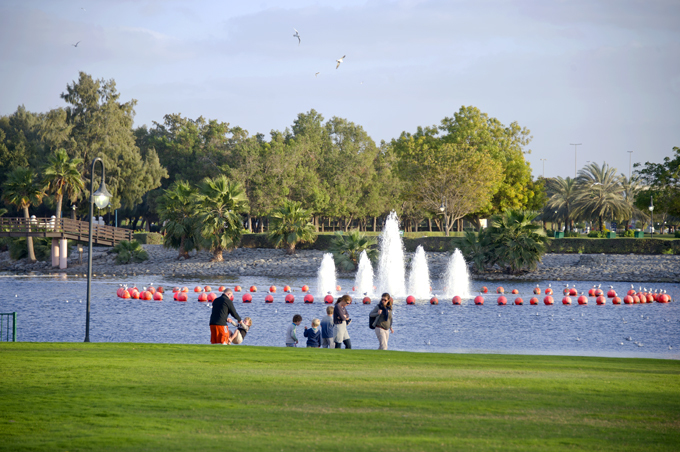 The Creek Park: Is a large park with lots of open grass, and it is famous for its cable car, which give you a great chance to enjoy the beautiful views of Dubai, where visitors take off from the cable car station in the park to take a tour from Al Garhoud Bridge to Al Maktoum Bridge. Dubai Dolphinarium: is one of the most sophisticated dolphin habitats in the world. Here you have the opportunity to swim with dolphins, choose from a range of dolphin experiences suitable for all ages and swimming abilities. Interactions range from standing in shallow water to swimming or scuba diving alongside these charismatic creatures, these activities are available in "Dolphin Bay" in Atlantis hotel, and in "Dubai Dolphinarium" at Creek Park.